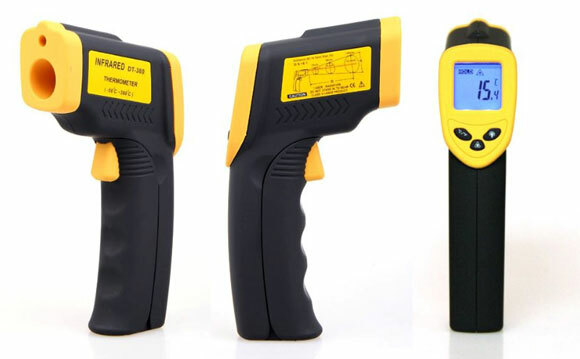 HDE Infrared Thermometer on Amazon: $16 (free shipping if your order comes is over $25). Regular Price, $71 — that’s a $55 discount. Infrared thermometers are great. Like laser rangefinders, they have a very useful function, but also are addictively fun in that childishly awesome way. Point it at something, pull the trigger and — “beep” — you immediately know how hot or cold it is. I already have two of these and might pick up a third based on this undeniably low price. $16, no shipping charges. Goes up to 750 degrees Fahrenheit, and has a handy laser pointer to help direct the beam. I don’t know what the spot ratio is for it, but at this price, even the lower end would be OK. These are great for pizza ovens. Fire it up, get the walls and floor up to temperature, and cook away. Similarly, put your pizza stone in your broiler and you should be able to get some great results too. Unless you have a high-end wood fired oven that rages hot, you should be covered by this thing. Otherwise, look for one that goes over 1000 (this one goes to 3000ºF, but you can find some deals on stuff the high-900F range. I got one like that at Harbor Freight). Winter Jackets North Face Outlet with the high-quality are sale with a big discount for you. We sure that you will have a good feeling on the our The North Face Outlet online shop, you can not miss this good choice to buy our Cheap North Face Jackets on sale.